I drew rough sketch of apple. But I couldn't like it. I don't know why. What I wanna draw? How I wanna draw? However, I believe be able to love my picture... some day. 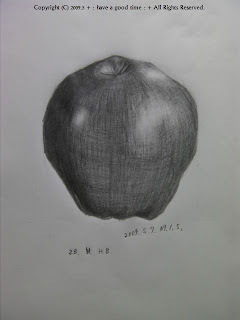 I thought that an apple was distorted form. We believe to see an object precisely, but we can't do a careful observation. Thank you! :-) I'm glad.